Organisers of the beef industry showcase, the National Beef Association (NBA) Beef Expo 2019, taking place in Cumbria on 23rd May, have announced huge support for its two key competitions, as entries start to draw to a close. 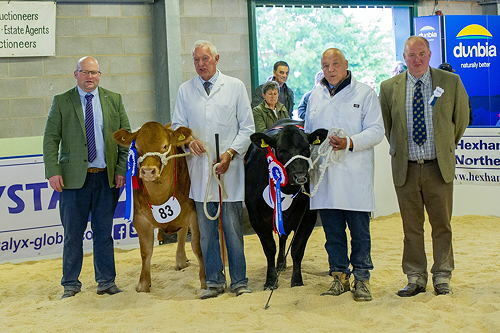 The NBA Commercial Cattle Show and the South Devon Herd Book Society Performance Championships have both attracted encouraging entry numbers, as the national event for the beef sector, Beef Expo 2019, this year takes place at North West Auctions’ J36 Rural Auction Centre in Crooklands, Cumbria. “We are currently up to 115 entries, with only five spaces free as we draw to the entry deadline,” explains Julie Sedgewick, organiser of the Cattle Show Competition. Sponsored by Caltech Crystalyx, there is more than £6000 of prize money up for grabs for the national competition. “It has been really encouraging, we are really happy with the excellent level of support,” she adds. Entries have been recorded from across the UK, with many coming down from Scotland, as well as from as far afield as Somerset and Lincolnshire, as well as a good level of competitors from Wales. “We will have four classes of Limousin heifers, split into weights, with 35 entries anticipated,” adds Julie. There are no more than 10 animals in any class. Experienced judge at many national shows, and award-winner himself, Gavin Scott of Gateside Farm, Linlithgow, will be judging the Native and Continental classes, as well as the Supreme Championships. Another well-known name and face, Tudor Edwards of Corwen will be judging the Baby Beef classes, Baby Championship and Young Handlers competition. Mr Edwards brings a wealth of experience, and was also the 2015 winner of the Agri-Expo Supreme Beef Championships. For the fourth year, the South Devon Herd Book Society is also holding its Performance Championships, in which performance breeders from across the country are invited to compete. “We are still taking in bookings, and are aiming for 20-25 animals. There is £500 prize money up for grabs from the Society, plus money back on animals forward. Entries are open until 7th May. “It’s the fourth such annual event, aimed at pushing the use of genetic and performance information as a breeding tool.